I'm sketching an ink drawing. It's going to be black and white cityscape with a sun in the background. The perspective is twisted and I have no idea how I should place the line between the part which is lit by the sun and the dark side. Does anyone have an idea? I attached the original sketch and my ideas beneath. Basically, you'll want to use a perspective-based method of drawing shadows, such as the technique I demonstrated here: How to calculate the shadow direction, size, and transparency? However, you'll need to be doing a modification on your perspective lines to match the distortion you're doing for the perspective in general. If I'm reading your sketch correctly, you've drawn a warped/wavy grid that represents the perspective, so your light perspective lines would have to "snap" to that same grid. In the end, this just means the the shadows that fall on the ground or objects will curve along the same paths as everything else, and be as "straight" as your sidewalk is. Keep in mind, though, that the sun is very high in the sky, which likely means that your light source point will be well off your page (unless you're drawing the sun in a low position like setting/rising, then it may very well be on your page). 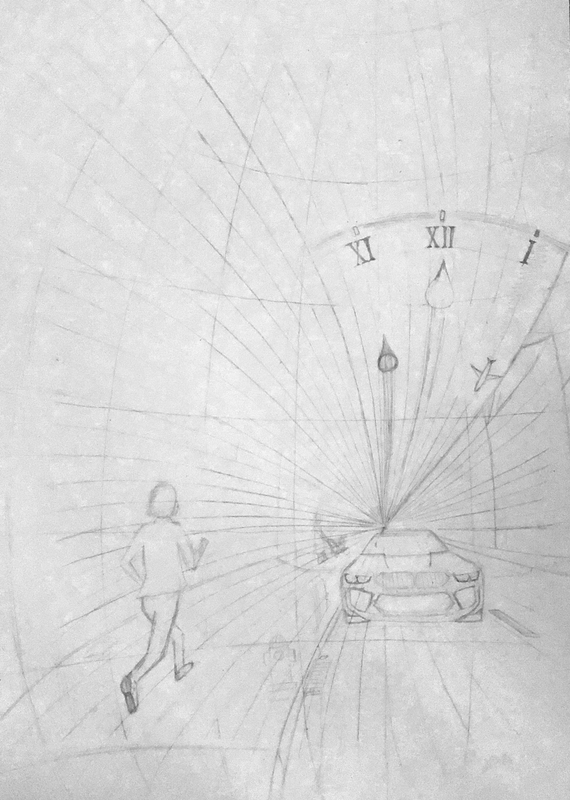 The shine from the sun will stop where something blocks it: the car, the hands of the clock (maybe), the jogging figure. Not the plane since its shadow will be cast away from the ground if the clock is the sun and is the source of the light. So your shadows will start wherever there is an object between the clock and the viewer. Since you are using single point perspective and the sun/clock is at the same point as the perspective convergence you already have a big clue as to where the shadows will fall. 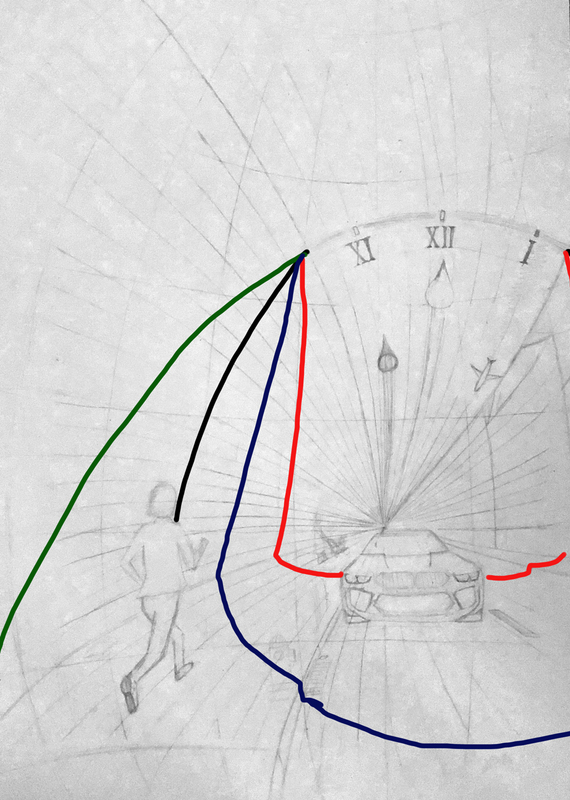 The light rays will be following the same path as the perspective lines, the distortion of the perspective is not a problem as the shadows will flow along the same distorted lines. edit: You mention that it will be black and white pen art but doesn't matter if you are using pen and ink or graphite or paint, the shadows will start and lay in the same place. Also, even though you are only using black marks on a white page, you can still introduce tone through line weight, texture, and pattern. Not the answer you're looking for? Browse other questions tagged drawing ink or ask your own question.